Our sleek, contemporary Amish San Marino Dining Chair will update any home setting. Notice the refined curve of the back chair legs adding another classy touch. The hardwood seat is standard but if you select the upholstered seat you can expect a firm place to sit. This isn't one of these upholstered chairs that you sink into. This is one of Jim Miller's favorite dining chairs! 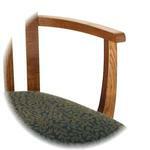 These chairs are available in a wide variety of hardwood options. Choose from the following wood selections. 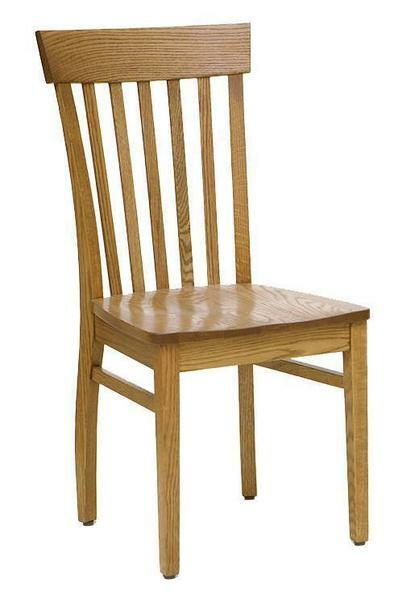 This dining chair can be built to your specifications. Our Amish woodworker can also build it as commercial grade furniture giving it that added durability and strength to withstand a lot of use. We offer volume pricing for large contact sales or hospitality furniture orders. Please call with questions on our American made furniture or visit us in Sarasota, Florida at our Amish furniture store. Hi Valerie, Attached are two pictures of the table and chairs. Thank you again for all of your help. We are delighted with how it all turned out. The craftsman did a wonderful job and your company was a pleasure to work with. Dear Wonderful Friends at JMX! Thank you, thank you, thank you!! My husband, Fred and I received our new Amish dining table and chairs last evening. We have never seen such beautiful workmanship as that from the Amish Community. Their fine reputation for quality has always been perfection! They are true artisans! We are completely awed with the fine wood work and precision that went in to the crafting of these beautiful pieces! There is no doubt we found the very best in the JMX Corporation and all of you, who care so much about your products, how they are crafted and manufactured, and ultimately providing such personal care in the process. We truly appreciate all of the time you each spent processing our order to insure that all was exactly right! That's the ultimate in Customer Service! We applaud you! It is rare to find such wonderful people who are in the business of true customer satisfaction. You all have exceeded our expectations, and we could not be happier. We also need to mention how we appreciate the outstanding efforts and personal attention from Mr. Gary Blevins, the gentleman who delivered our dining room furniture and handled it with all the "tender loving care" one could ever expect! He called us numerous times as he made his way through the upper north west as he headed toward our home in Surprise, AZ. He arrived around 8:30 p.m., and unloaded and handled the table and chairs pieces meticulously! He was pleasant, though obviously somewhat fatigued, but had promised delivery on February 2nd, and there he was! What a guy! Again, we are so grateful to you all and to Gary Blevins for all that you do! We truly appreciate all of your combined efforts in making our purchase a very special, and satisfying experience! We wish you all our sincere gratitude and continued success!